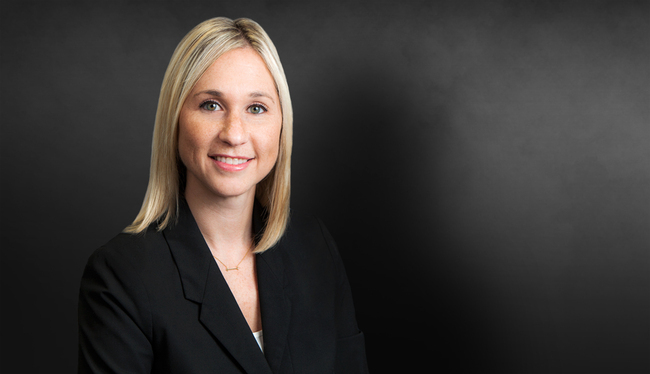 Kate Spinelli focuses her practice in complex civil defense litigation. She has assisted in successfully litigating and resolving numerous cases alleging wrongful death, catastrophic personal injury, products liability, premises liability, and professional liability. She is also skilled in nursing home and long-term care litigation. Prior to joining Weinberg Wheeler Hudgins Gunn & Dial in 2011, Kate was an associate with a full-service law firm in New York. She is admitted to practice in Florida, New York and New Jersey. Successfully petitioned Florida’s First District Court of Appeals for a writ of certiorari on behalf of a defendant in a personal injury lawsuit, where the plaintiffs attempted to compel production of the defendant’s expert’s opinions regarding causation between the subject motor vehicle accident and plaintiff’s surgery. SCI Funeral Services v. Walthour, 165 So. 3d 861 (Fla. 1st DCA 2015). Defended insurance company in two-week class action jury trial involving claims of independent contractor misclassification under ERISA involving approximately 7,000 class members. Obtained voluntary dismissal by Plaintiff's for global leader in the beverage industry in tractor-trailer collision. Obtained dismissal with prejudice of negligent security lawsuit involving alleged assault and robbery. Assisted in the defense of product manufacturer against claims of design defect and failure to warn involving catastrophic injuries. Assisted in the defense of premises owner in wrongful death claim stemming from fall from ride. Assists in the defense of drivers and transportation companies/employers involving catastrophic accidents, resulting in fatalities/multiple injuries.